Publisher’s blurb: Duress – the extreme experience war produces – brings out the most remarkable human qualities, and letters written in wartime contain some of the most intense emotion imaginable. This anthology includes letters that date as far back as the Boer War (which began in 1899) and extend up to 2002, when Canadian peacekeepers served in Afghanistan. Between are letters from the First and Second World Wars, the Korean War, and a number of peacekeeping missions. It contains some of the most powerful writing that Canadians – whether reassuring loved ones, recounting the bitter reality of battle, or describing the appalling conditions of combat–have ever committed to the page. The letters Canadians have written during wartime are proud and self-deprecating, stoic and complaining, brave and fearful, tender and violent, funny and poignant. The Book of War Letters tells us something about what it means to be Canadian, and what it means to be alive. Paul Grescoe has been chronicling Western Canadian entrepreneurs for decades–from the legendary Vancouver billionaire Jim Pattison (“Jimmy”) to the Winnipeg couple who founded the Harlequin romance empire (“The Merchants of Venus”). With his wife, Audrey, he is also a compiler of three recent volumes of private correspondence that illuminate Canadian history. The Grescoes live on Bowen Island, a world away from the rest of British Columbia. Audrey Grescoe has been a freelance journalist and a newspaper and magazine editor; more recently she has written books on travel and nature. Paul Grescoe has contributed to most of the major Canadian magazines and has also written books, including detective novels and “The Merchants of Venus, about the Harlequin publishing empire. They live on Bowen Island, near Vancouver, B.C. 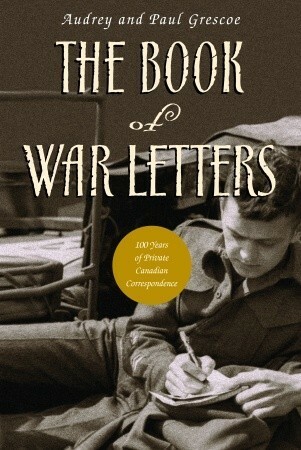 The Book of War Letters: 100 Years of Private Canadian Correspondence [McClelland & Stewart, 2005] is the second of a three-part series by the husband and wife team of Paul and Audrey Grescoe; the other parts being: The Book of Letters and The Book of Love Letters. As I have oft stated in the past, it is a real cause for celebration when I come across personal journals, first hand observations, or in this case letters that tell us things about our ancestors and our past that history books can only hint at. Moreover, the several generations covered in this collection may be the last to speak in such a manner, for telephone calls cannot be bundled and e-mails can’t take us back to our ancestors’ ways of behaving and thinking and viewing the world. This is a monumental work (442 pages of letter) from the Boer War, 1899-1902, The Great War, 1914-1918, The Second World War, 1939-1945, Korea. 1950-1953, The various “Peacekeeping” missions, 1954—, and the ongoing conflict in Afghanistan, 2003—. However, these should not be viewed as just “war” correspondence, for they cover the gamut of emotions from patriotism to disillusionment; from protestations of love to “dear John letters; from “fear” lurking between the lines to reassurance for the folks back home. They are also happy-go-lucky, sad, resigned, and condoling when written by an officer or chaplain regarding a casualty. Of course they all contain the admonition that “war is hell,” but the difference here is that this was written by individuals, boys, men, women, who were there, i.e. The Book of War Letters is highly recommended for history buffs, writer and scholars specializing in military history, and for all those who have an interest and fascination in human nature. Get an autographed copy of my e-books, Two Irish Lads and Nor All Thy Tears throughAuthorgraph. Click on the link below to learn how.